Dirac matter is one of the highlights of the Condensed Matter of the 21st century. The modern approach started with the synthesis of graphene in 2005 and the success of the theoretical predictions based on the very simple Dirac equation. 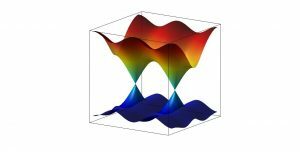 Dirac physics is also at the root of the non-trivial topological properties of the materials that followed graphene: Topological insulators and superconductors, and Dirac and Weyl semimetals in two and three spatial dimensions. Our group has pioneered contributions in this area not only in graphene but also in the more recent materials. Weyl semimetals were synthesized in 2015. Of special importance is our contributions to the non-linear optical phenomena , deduction of elastic gauge fields in Weyl semimetals , and anomaly related response functions mixing elastic (gravitational), thermal, and electromagnetic degrees of freedom . A peculiar aspect of most Dirac materials is that many of their physical properties can already be explained at the non-interacting level. This was particularly noticeable in the case of graphene whose effective coupling constant is big and, yet, interactions do not seem to play a major role. Under the condensed matter point of view it is important to understand the behavior od these materials whose Fermi surface is reduced to a point in momentum space defying one of the Fermi liquid paradigms. Our group studied the role of interactions in graphene  and, more recently, in Weyl semimetals . Non-Fermi liquid behavior of electrons in the half-lled honeycomb lattice. A Renormalization Group Approach, Nucl.Phys. B424 (1994) 595-618 arXiv:hep-th/9311105.